It’s common knowledge that smiling is good for you, but new studies are uncovering more fascinating ways in which it can help across your health, work and happiness. Here are some compelling research-based facts and figures about why it’s good for you to smile. The famous song “When You’re Smiling” was written in 1928 and those lyrics “smile and the whole world smiles with you” have been sung by many well-known artists since. It’s only recently though that scientific studies have been able to prove it conclusively. 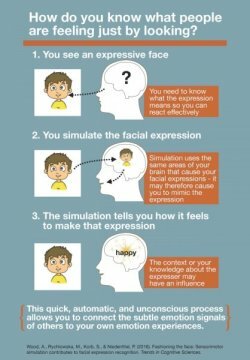 This 2016 study from Trends in Cognitive Sciences explains the automatic, subconscious behaviour of mimicking other people’s facial expressions. The person mimicking then actually experiences the emotion associated with that expression as well. So, if you want those around you to be happy, one of the easiest things you can do is smile – and it’s free! Regardless of culture, language, nationality or any other aspect of your background, humans smile when they are happy. It’s programmed into us and starts when we are newborns on recognising our parents faces or voices. A warm smile will be understood as a positive signal wherever you go. So when you’re meeting someone new or travelling to a foreign country, a smile is a great start – even if you don’t speak the same language. Customer satisfaction is greatly affected by smiling, positive staff. This study from Pennsylvania State University showed that, as long as service was good, positive facial expressions enhanced customer satisfaction. So to get results are work – perhaps even win that promotion – displaying a smile and other positive behaviours should help you get ahead. For business owners, this type of body language training for your staff, as well as recruiting people who display a natural smile and positivity, could help boost profits. In a renowned study published in 2010, researchers Abel and Kruger at Wayn State University in the US looked at historic photographs of baseball players from nearly 50 years previous. A clear link was found between the size and intensity of their smile, and their lifespan over the following years. It seems smiling really does help you live longer! At Meneage Dental in Cornwall, we love helping people to improve the appearance of their teeth and their overall dental health, and to have the confidence to smile freely. Why not contact us for an informal discussion of your needs?